I have been showing this breed for many years and fell in love with them. 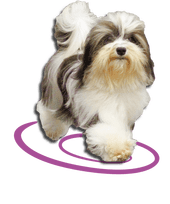 The Havanese is a wonderful breed originating in Cuba where they are lap dogs. Their expression is soft and intelligent, mischievous rather than cute. They are very playful and alert and have fun little clown like personalities. They make great dogs for children or adults alike. They should be from 8-1/2 to 11-1/2 inches tall at the shoulders. They are sturdy, yet small enough to be a toy breed. Their gait is lively, unique, and with a nice spring to there step. They should have a soft and silky coat with a little wave to it. They come in many different colors and no color should be preferred over another. 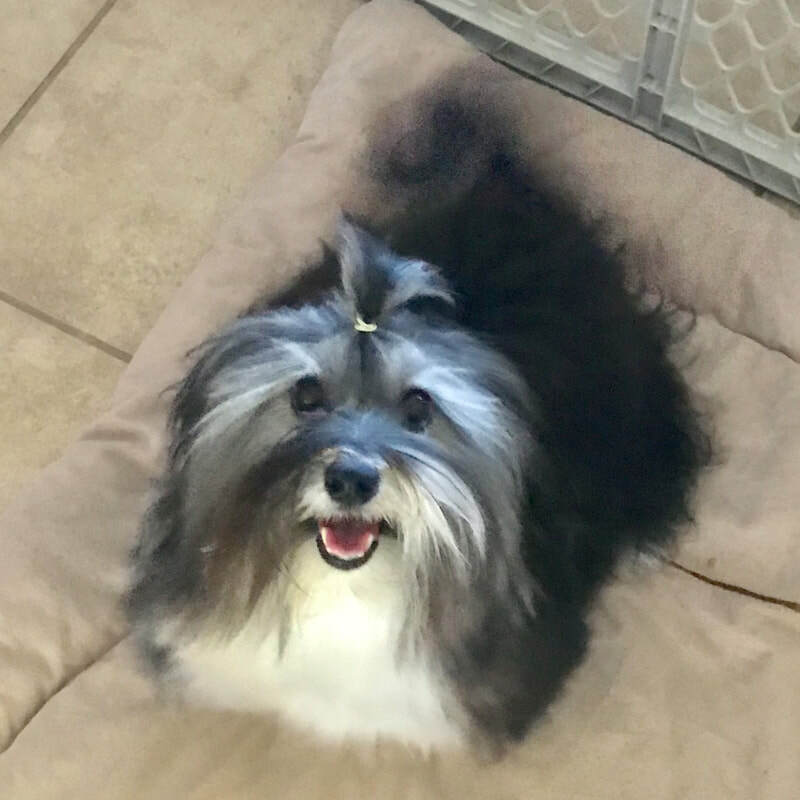 Please enjoy my site and my Havanese as much as I do. We have puppies available in Havanese for show as well as for companion homes. 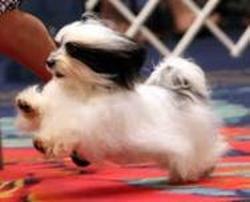 Havanese also excell in agility,obedience, service dogs and extreamly well for therapy dogs. We are and AKC Breeder of Merit, producing many champions and health testing our dogs. We have now had couple of our havanese become top 20 dogs and achieve some big wins. We are proud of the success they have done so far and hope to continue doing more of it. Please contact us for more info about our dogs and see our puppies pages to view what is available. (1) General Appearance The Havanese is a small, sturdy dog of immense charm. The native dog of Cuba, he is beloved as a friendly, intelligent and playful companion. He is slightly longer than tall, with a long, untrimmed, double coat. 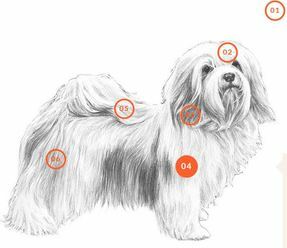 The Havanese has a short upper arm with moderate shoulder layback and a straight topline that rises slightly from the withers to the croup. The plumed tail is carried arched forward up over the back. The unique springy gait is a result of the breed's structure and playful, spirited personality. These characteristics of temperament, coat, structure and gait are essential to type. (2) Head The expression is soft, intelligent and mischievous. Eyes are large, dark brown and almond-shaped. Chocolate dogs may have somewhat lighter brown eyes. Eye rims are solid black for all colors except for chocolate dogs which have solid brown eye rims. Incomplete or total lack of pigmentation of the eye rims is a disqualification. Ears are broad at the base, dropped, and have a distinct fold. They are set high on the skull, slightly above the endpoint of the zygomatic arch. When alert, the ears lift at the base but always remain folded. Ear leather, when extended, reaches halfway to the nose. (3) Body The neck is slightly arched, of moderate length, blends smoothly into the shoulders and is in balance with the height and length of the dog. The prosternum is evident but not prominent. The chest is deep, well developed, and reaches the elbow. The straight topline rises slightly from the withers to the croup. Measured from point of shoulder to point of buttocks, the body is slightly longer than the height at the withers. This length comes from the ribcage. Ribs are well sprung. The loin is short and well muscled. There is a moderate tuck-up. The tail is high-set and arches forward up over the back. It is plumed with long, silky hair. The tail plume may fall straight forward or to either side of the body. While standing, a dropped tail is permissible. The tail may not be docked. (4) Forequarters The tops of the shoulder blades lie in at the withers, allowing the neck to blend smoothly into the back. Moderate shoulder layback is sufficient to carry the head and neck high. The upper arm is short. Elbows are tight to the body and forelegs are straight when viewed from any angle. The length from the foot to the elbow is equal to the length from elbow to withers. Pasterns are short, strong and flexible, very slightly sloping. Dewclaws may be removed. The feet have arched toes and point straight ahead. Pads and nails may be any color. (5) Coat Silky to the touch, the coat is soft and light in texture in both outer and undercoat, although the outer coat carries slightly more weight. The coat is long, abundant and wavy. It stands off the body slightly, but flows with movement. An ideal coat will permit the natural lines of the dog to be seen. Puppy coat may be shorter and have a softer texture than adult coat. The coat may be corded. Corded coats will naturally separate into wavy sections in young dogs and will in time develop into cords. Adult corded dogs will be completely covered with a full coat of tassel-like cords. (6) Hindquarters The hind legs are muscular with moderate angulation. Hocks are well let down; pasterns are parallel from hock to foot. The croup is slightly higher than the withers. Dewclaws may be removed. The feet have arched toes and point straight ahead. Pads and nails may be any color. Do Everything you do for the Glory of the one who made you.